Mercuric chloride (HgCl2) injected subcutaneously three times weekly at a dose of 100 μg/100g body weight to rats has different effects on the immune system depending upon the strain used. Brown-Norway (BN) rats develop an autoimmune disease characterized by a lymphoproliferation of B and CD4+ T cells and by an hyperimmunoglobulinemia affecting mainly IgE. Antibodies of various specificities are produced including autoantibodies (anti-laminin, anti-collagen IV, anti-nuclear) and antibodies to non-self antigens such as TNP or sheep red blood cells. As a consequence they develop an autoimmune glomerulonephritis, a Sjogren’s syndrome and a mucositis. This disease is due to a T-dependent polyclonal activation of B cells probably mediated by the appearance of autoreactive anti-self class II T cells. The disease can be transferred to syngeneic rats by T cells from HgCl2-injected rats. Indirect evidence for a role of interleukin 4 (IL-4) was recently obtained since an increase of Ia expression was observed on B cells. Interestingly this increase was observed as soon as 3 days following the first injection of HgCl2 and represents therefore a very early marker of the effect of HgCl2 on the immune system. The disease may also be induced giving HgCl2 by different routes (orally, respiratory) or by using other inorganic compounds (HgCl2, HgNH2Cl). By contrast, HgCl2 does not induce autoimmunity in Lewis (LEW) rats. It induces in that strain an increase in the number of CD8+ T cells responsible for a non-specific immunosuppression (inhibition of the proliferative response of T cells to mitogens and of the local graft-versus-host response). More interestingly, HgCl2 attenuates or even abrogates organ-specific autoimmunity (experimental allergic encephalomyelitis or Heymann’s nephritis) when LEW rats receive HgCl2 three to four weeks before immunization with the autoantigen. That CD8+ T cells are responsible for the immunosuppression observed has been confirmed since treatment with an anti-CD8+ T cell monoclonal antibody (OX8) completely abrogates the protection. Finally, susceptibility to autoimmunity is genetically controlled and 4 genes localized within and outside the major histocompatibility complex are involved. 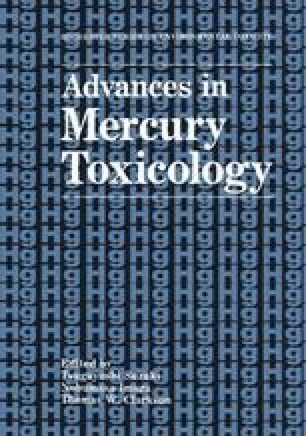 In conclusion: inorganic mercury may induce either autoimmunity or immunosuppression depending upon genetic factors.